What really happened to Jesus Christ during the mysterious missing 18 years in his life, from the age of 12 to 30, that are not accounted for in the new Testament? Catholics call that period of Jesus’ life “The Lost Years” or “The Hidden Years.” Only the Gospel of Luke refers to those years, in just one sentence. Thanks to Edward T. Martin’s extraordinary research and travels, some of the answers may be found here. 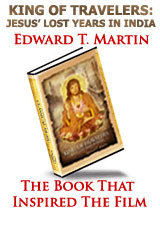 This is the book that inspired the 2008 Paul Davids film distributed by NBC Universal International Television, “JESUS IN INDIA,” as seen on the Sundance Channel and featuring author Edward T. Martin’s quest in India to attempt to unravel ancient mysteries about the historical Jesus. This is a revised and updated version of the first edition. Also, look for Edward T. Martin’s new companion book: JESUS IN INDIA: KING OF WISDOM – THE MAKING OF THE FILM & NEW FINDINGS ON JESUS’ LOST YEARS. New concepts of the historic person of Jesus of Jazareth are emerging from studies of ancient texts discovered in the Holy Land and Egypt and even India. Pope Benedict the 16th acknowledges the findings of new information in his book JESUS OF NAZARETH. However, what the Pope does not discuss, which you will learn much about in this book, is that the concept that Jesus was in India during the Lost Years is not new to anyone in India, be they Hindu, Buddhist, Muslim or Christian. The Apostle Thomas brought Christianity to India after the crucifixion and preached there for about twenty years. Jesus sent him. And a widespread view in India is that in choosing India, Jesus was sending Thomas to a country Jesus already knew very well from Jesus’ travels there during the Lost Years. But how does one separate myth from evidence and fact? 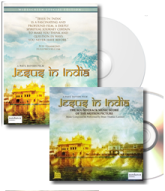 Join researcher and explorer Edward T. Martin as he journeys to remote exotic locations in India, Nepal, Afghanistan and elsewhere in Central Asia, unraveling the mysteries of Jesus’ Lost Years. Follow the author, an accomplished mountain climber, on a thrilling journey of spiritual discovery as he travels the world from Alaska to the Himalayas in search of lost knowledge.